Includes 2 hour private yacht rental for the selected cruise, round-trip hotel transfers, complimentary tea & coffee on-board, crew, fuel and all taxes. Includes 2 hour private yacht rental for the selected cruise, round-trip hotel transfers, complimentary tea & coffee on-board, crew, fuel and all taxes. Optional Lunch: Choice of menus available from 25 Euros per person. Includes 2 hour private yacht rental for the selected cruise, round-trip hotel transfers, complimentary tea & coffee on-board, crew, fuel and all taxes. Optional Dinner: Starting from 25 Euros per person with a choice of menus. Includes 3 hour private yacht rental for the selected cruise, round-trip hotel transfers, complimentary tea & coffee on-board, crew, fuel and all taxes. Optional Dinner: Starting from 35 Euros per person with a choice of menus. Includes 4 hour private yacht rental for the selected cruise, round-trip hotel transfers, complimentary tea & coffee on-board, crew, fuel and all taxes. Includes 6 hour private yacht rental for the selected cruise, round-trip hotel transfers, complimentary tea & coffee on-board, crew, fuel and all taxes. Includes 8 hour private yacht rental for the selected cruise, round-trip hotel transfers, complimentary tea & coffee on-board, crew, fuel and all taxes. 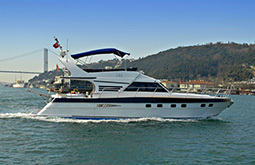 We can pick you up right from your hotel or cruiseship in Istanbul with round-trip hotel transfers provided (FREE for European-side city-center hotels/cruiseships), or directly from selected Bosphorus hotels with their own piers (for hotel residents only), or Kuruçeşme, Arnavutköy, Beşiktaş and Kabataş piers.